SnarkyDork: How Many Times Can I Edit This? Note to self: Don't try to write coherent thoughts when operating on a cumulative sleep deficit for the week. Also, there is a spell check function...Use it! 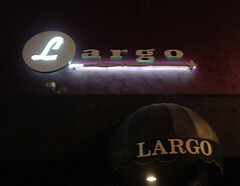 Last night we went to one of my very favorite places, Largo. It's an intimate venue where some pretty cool artists perform. I go there mainly for music, but occasionally comedy too. Nickel Creek played their upcoming new album for the sold out room, followed by some older favorites. They are best described as a bluegrass band, so unfortunately most of their exposure comes from country radio and CMT. KCRW does play them however, which is how we discovered them. I was blown away by a show they did at the Hollywood Bowl last season, complete with the orchestra backing them for a few tunes. After the show we wandered around Fairfax a bit and ended up at the Nova Express Cafe. We've walked by it a million times and I have no idea why we never stopped in. They have a great menu and the food was very good. They are also open until 3am during the week and 4am on weekends. We are always on the lookout for a new latenight eatery, so we can add this find to the list. The decor is sci-fi, outer space, robots, action figures, comic books, etc. Very cool. Eric wanted to take some of the lenticular art home with him. 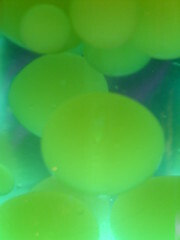 I happened to dig the lava lamps on every table. No wonder I slept through my alarm this morning!